Melt candy melts in a microwave-safe bowl, according to package directions. Dip one end of the sucker sticks into the candy melt. Press sucker sticks into marshmallows, and allow candy melt to cool. Dip entire marshmallow into the candy melt, until fully coated. Press the bottom of the sucker stick into a piece of styrofoam, allow candy melt to cool completely. Slice fruit rollups into 1/2 inch strips. Press strip around the bottom portion of the marshmallow to create blue overalls for your minions. Pipe a big, black circle (or two smaller black circles) onto each marshmallow. Press a candy eyeball (or two candy eyeballs) into the icing. Pipe a thin, black line from one side of the eyeball, around the back of the marshmallow, until it touches the other side of the eyeballs to create goggle lines. Allow icing to harden completely. Share! Minions! Millions of them! Made with marshmalllows! This treat is so cute, it's downright despicable. Despicable Me 2 – opens only in theaters July 3rd. Celebrate with a movie-themed marshmallow treat that is so simple to make, even your little Minions can help! These adorable Despicable Me Minions are made with just a few simple ingredients, and look almost too adorable to eat! Here's what you need. A few basics. Some of which will have to be picked up at a craft or cake store. So, you don't just get to play with your food, you get to shop, too. Yay, you! Start by melting the candy melts in a microwave-safe bowl, then dip each stick into the bottom of the melt, push it into the middle of a marshmallow, and allow the candy melt to harden a bit before dipping the entire marshmallow into the candy melt. Just like this! Press the marshmallow into the candy melt until completely covered. Tap it gently against the edge of the bowl, to get any of the extra candy melt off of the marshmallow. Once the candy melt has completely dried, open up a batch of specially marked Despicable Me Fruit Roll-Ups, and use a pair of scissors to cut the blue portion of the Fruit Roll-Ups into 1/2" ribbons. Gently fold the blue ribbon around the bottom half of the marshmallows to make the little Minion overalls. Press it against the marshmallow until it sticks. Fit the black icing tube with the writing tip. Pipe the icing into the center of each marshmallow, then pipe a small line from the edges of the eyeballs to create goggles. Allow the icing to harden, then you're ready to share! 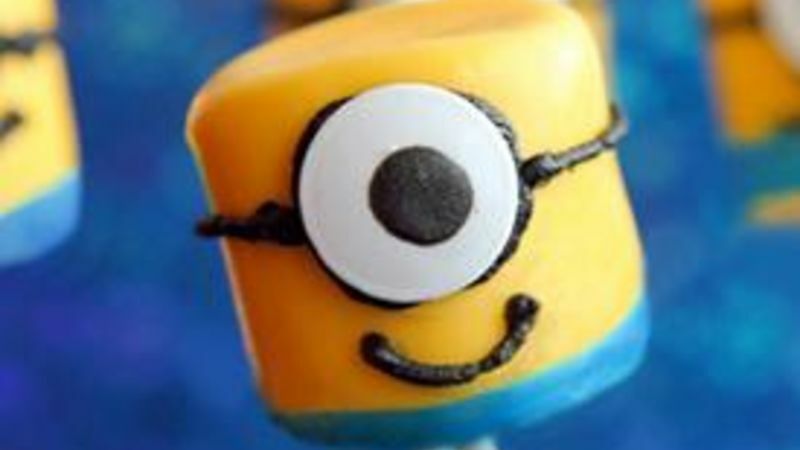 Turn those despicable little Minions into brownie toppers by piping a bit of icing on top of storebought brownie bites, and press the marshmallows right up top.